Neonatal PMN are qualitatively impaired in functions, yet they frequently reveal augmented inflammatory reactions during sepsis. Here, we hypothesized that PMN from newborns produce more IL-6 than those from adults under LPS stimulation, in which transcriptional or posttranscriptional regulation is involved in the altered expression. We found that neonatal PMN produced significantly higher IL-6 mRNA and protein than adult PMN. The higher IL-6 expression was not related to transcriptional but posttranscriptional regulation as the IL-6 expression was affected by the addition of cycloheximide but not actinomycin. To examine whether miRNA was involved in the IL-6 regulation of neonatal PMN, we surveyed differential displays of miRNAs that could potentially regulate IL-6 expression before and after LPS stimulation. Four miRNAs: hsa-miR-26a, hsa-miR-26b, hsa-miR-142-3p and hsa-let 7g decreased or increased after LPS treatment for 4 h. Further validation by qRT-PCR identified miR-26b, miR-142-3p and let-7g significantly changed in neonatal PMN after LPS stimulation. The functional verification by transfection of miR-142-3p and let-7g precursors into neonatal PMN significantly repressed the IL-6 mRNA and protein expression, suggesting that miR-142-3p and let-7g negatively regulate IL-6 expression in neonatal PMNs. Modulation of miRNA expression may be used to regulate IL-6 production in newborns with altered inflammatory reactions. Keywords: miR-142-3p, let-7g, polymorphonuclear leukocytes, cord blood, IL-6, sepsis. Neonatal sepsis is still a major threat for infants, even with the development of antibiotics . Upon bacterial infections, older children and adults are usually able to restrict infection spreading; however, neonates are susceptible to bacterial sepsis with a severe systemic inflammatory response with respiratory distress and/or bacterial meningitis. There is growing evidence that this process is crucially mediated by the action of proinflammatory cytokines, such as IL-1ß, IL-6, and TNF-α [2, 3]. IL-6 is known to be a key component of LPS-induced endotoxemia and sepsis [4, 5]. However, expression of endogenous IL-6 can paradoxically reduce endotoxin-induced mortality. In addition to being an activator of acute phase responses, IL-6 is also critical for regulating innate immunity and promoting adaptive immune responses [6, 7]. Recently, more studies suggested the therapeutic potential of targeting IL-6 in certain inflammatory processes [8, 9]. With more understanding of IL-6 regulation, we might provide a better strategy to control altered inflammation of neonatal sepsis. Certain miRNAs have been demonstrated to regulate LPS-induced endogenous expression of IL-6 in mice model . The region targeted by miRNAs in the 3' UTR of IL-6 mRNA is relatively conserved between humans and mice . Thus, we make a hypothesis that PMN from newborns produce more IL-6 than those from adults under LPS stimulation, in which certain miRNA is involved in the altered expression of IL-6. To better characterize the mechanism of IL-6 expression by neonatal PMN, we screened the transcriptional and posttranscriptional regulation of IL-6 between newborns and adults, and validated what miRNA is involved in the regulation by manipulating loss or gain of function on the miRNA that regulates IL-6 expression between PMN from newborns and adults. First, we compared the IL-6 production by CB and AB PMN. 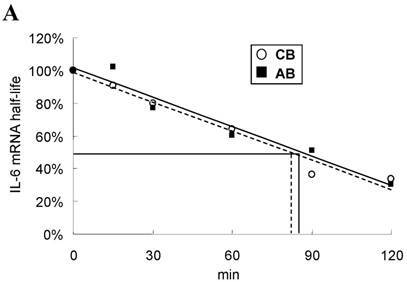 Under resting condition, CB and AB PMN had similarly lower IL-6 production. 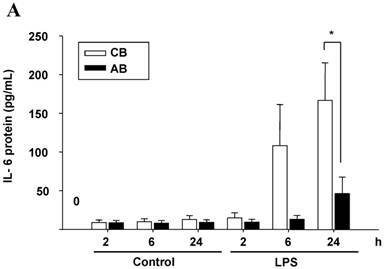 Upon LPS stimulation, the IL-6 production was increased both in CB and AB PMN (Fig. 1A). 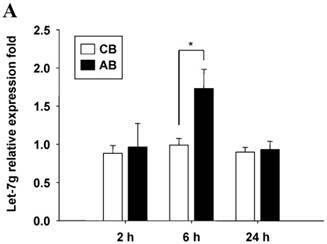 However, CB PMN had higher LPS-induced IL-6 production than AB PMN after 6 h stimulation and reached its significant level after 24 h of stimulation (p = 0.03). Immunohistochemical staining of PMN for IL-6 expression also showed a similar result (Fig. 1B). To identify whether LPS-induced IL-6 mRNA expression was compatible with IL-6 protein production, AB and CB PMN were stimulated with LPS and total RNA was extracted for IL-6 mRNA detection. As shown in Fig. 1C, CB PMN had significantly higher LPS-induced IL-6 mRNA expression than AB PMN after 4 and 6 h of stimulation. To explore the possible transcriptional or post-transcriptional regulation for the relatively higher IL-6 mRNA and protein expression in the CB PMN, we treated PMN from either CB or AB with 1 μg/mL of Act-D to block mRNA synthesis for studying the mRNA half-life. As shown in Fig. 2A, neonatal and adult PMN had similar IL-6 mRNA half-life values, which were 82.4±6.1 and 86.1±5.2 min, respectively. It suggested that mRNA decay did not contribute to the IL-6 mRNA expression difference between CB and AB PMN. 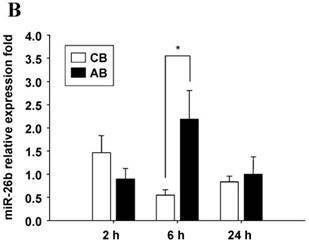 Subsequently, CB and AB PMN were treated with CHX for the indicated duration of time. As shown in Fig. 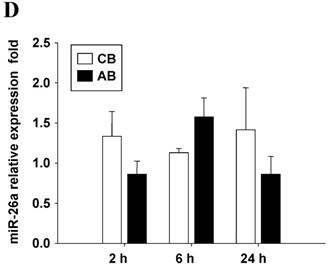 2B, 5 μg/mL of CHX treatment did not decrease the IL-6 protein level of either CB or AB PMN. However, with CHX treatment, CB PMN showed significantly higher LPS-induced IL-6 mRNA expression after 120 min of stimulation (p = 0.036), Fig. 2C. Overall, it revealed the mechanism of higher LPS-induced IL-6 protein in neonatal PMN was regulated at the post-transcriptional level. Further studies were then tried to demonstrate the role of miRNA in the post-transcriptional regulation of LPS-induced IL-6 expression. Using Illumina bead array, miRNAs expression in CB and AB PMN with and without LPS induction for 4 h were measured. Their data were integrated with the potential miRNAs which were identified from the miRanda, MicroCosm v5 and TargetScan v7.1 databases that target IL-6. There are 15 miRNAs related to the regulation of IL-6 gene expression (Fig. 3A). Four of the 15 miRNAs (hsa-let-7g, hsa-miR-26a, hsa-miR-26b, and hsa-miR-142-3p) were found to have decrease or increase significantly after LPS induction for 4 h (Fig. 3B). Experiments were later conducted to verify those 4 miRNAs expression by qRT-PCR. Level of let-7g and miR-26b increased significantly in adult PMN post LPS stimulation for 6 h as compare to CB, p = 0.042 and 0.02 respectively (Fig. 4A and 4B), whereas miR-142-3p increased significantly after 2, 6 and 24 h after LPS stimulation in adult PMN as compared to cord ones, p = 0.02, 0.013, and 0.003, respectively (Fig. 4C). 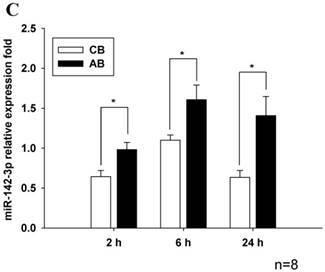 However, miR-26a was insignificantly changed with and without LPS stimulation between CB and AB PMN (Fig. 4 D). As let-7g, miR-26b and miR-142-3p changed significantly in CB and AB PMN after LPS-stimulation, therefore they were selected for transfection to validate their functions. The mimics of let-7g, miR-26b or miR-142-3p were then transfected into CB and AB PMN as functional validation studies (Fig. 5A & B). The viability of PMN after transfection was accessed and revealed no significant changes across various treatments, as shown in Fig. 5C. 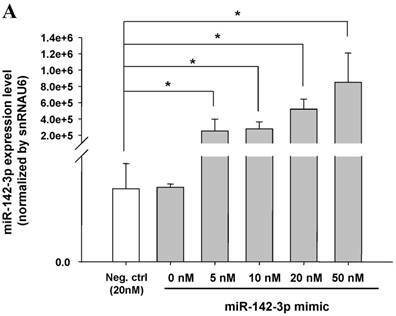 After transfection of miR-142-3p and let-7g mimics into PMN for 24 h, LPS-induced IL-6 mRNA expression of both AB and CB PMN were supressed, p < 0.01 for miR-142-3p (Fig. 5D); p = 0.013 for comparison of IL-6 mRNA of 0 vs. 20 nM of let-7g M (mimics) transfection into cord PMN, and p = 0.044 for adult PMN (Fig. 5E). Furthermore, LPS-induced IL-6 protein suppression effect of miR-142-3p mimics were significantly found on neonatal PMN, Fig. 5F. And let-7g mimics significantly suppressed IL-6 protein expression in cord and adult PMN post LPS stimulation, Fig. 5G. Nevertheless, transfection of miR-26b mimics did not suppress IL-6 mRNA and protein expression. Profile of miRNAs related to IL-6. 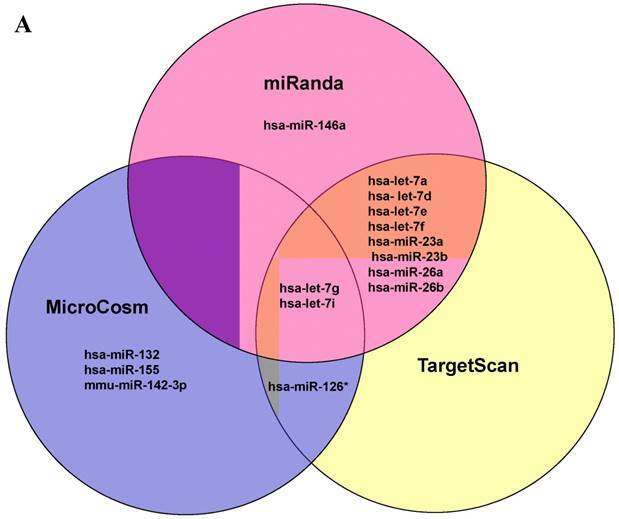 (A) Computational prediction of hsa-miRNAs targeting IL-6 3'-UTR by the miRanda, MicroCosm and TargetScan. The hsa-miR-142-3p, but not mmu-142-3p, was not predicted by all 3 programs. (B) Clustering of miRNA array expression between cord blood (CB) and adult blood (AB) without (Ctrl) and with LPS treatment for 4 h was done by unsupervised hierarchical clustering using Manhattan hierarchical cluster metric from Illumina Genome Studio version 3.1.3.0.
microRNAs are involved in the regulation of innate immune response . This study provides a novel insight into neonatal PMN which expressed higher IL-6 protein and mRNA level after LPS stimulation than adult ones. And it was regulated by miR-142-3p and let-7g at the post-transcriptional level, not by a longer mRNA half-life after LPS stimulation in CB PMN. The modulation of IL-6 expression by miR-142-3p and let-7g may be useful in the regulation of neonatal inflammatory disorders. Verification of Illumina array results with qRT-PCR for four miRNAs. 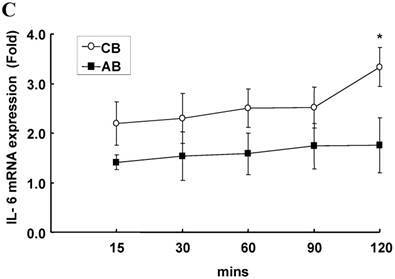 CB and AB PMN were stimulated with 100 ng/mL of LPS for indicated time. Cells were collected and indicated for (A) let-7g, (B) miR-26b, (C) miR-142-3p, and (D) miR-26a detection with qRT-PCR. The data shown are mean ± SEM from 4-8 independent experiments. * denotes p < 0.05. We used three prediction software programs to detect potential miRNAs that may target IL-6 expression. Fifteen miRNAs predicted to be related to the regulation of IL-6 gene expression were found at least in one of the 3 algorithms. These results were integrated with our bead array data. Using qRT-PCR, verification of let-7g, miR-26a, miR-26b, and miR-142-3p were performed along with the discovery of let-7g, miR-26b and miR-142-3p that had significantly changed post LPS stimulation. Thus, their mimics were chosen to transfect into cord and adult PMN to validate their functions. We found that miR-142-3p is only predicted by one program, but was involved in IL-6 mRNA and protein expression by neonatal PMN after LPS-stimulation. In fact, miR-142-3p had been demonstrated to regulate LPS-induced endogenous expression of IL-6 in a mouse model . 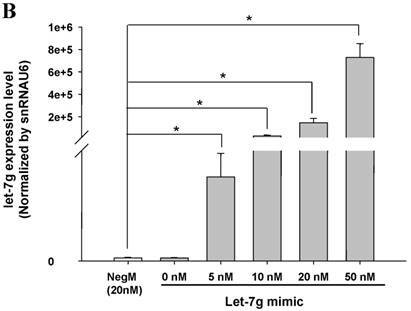 In contrast, two miRNAs (let-7g and let-7i) were predicted to target IL-6 expression by all the 3 algorithms. But only let-7g had prominent signal intensity changed in the array. This study also suggests that using 3 prediction databases to choose target miRNAs may be needed to explore the target miRNAs that regulate the expression of cytokines in different tissues. In this study, Illumina BeadChip miRNA array was used instead of Agilent SurePrint human miRNA microarray chips, which revealed insignificant change of let-7 g and miR-142-3p in cord and adult PMN post LPS treatment in our previous study . Although different microarray caused different result, nevertheless, the qRT-PCR data could reproduced the trend of the Illumina chip results (Fig. 3B, 4A and 4C). 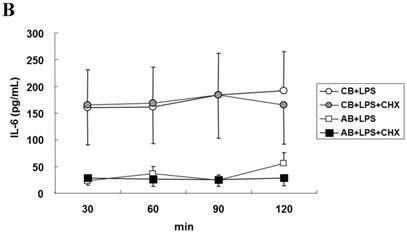 After LPS stimulation for 2 h, level of miR-142-3p decreased in cord PMN, then increased in 6 h, and decreased again in 24 h. On the contrary, it increased in adult PMN in 6 h and 24 h post LPS stimulation (Fig. 4C). It might explains miR-142-3p repressed mRNA with the highest IL-6 mRNA found in cord PMN after LPS stimulation for 4 h, thereafter, decreasing its level in 24 h. Moreover, level of let-7g was unchanged in cord PMN as compared to adult PMN (increased almost 2 fold) post LPS stimulation. 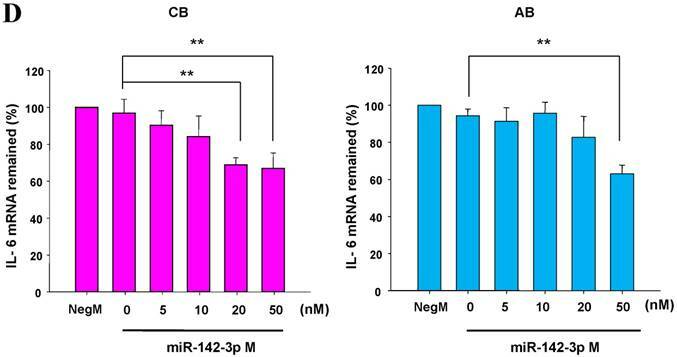 Collectively, higher level of miR-142-3p and let-7g in adult PMN versus limited changed of miR-142-3p and unchanged of let-7g in cord PMN post LPS stimulation explain the negative modulation of these miRNAs on higher IL-6 mRNA and protein in cord as compared to adult PMN post LPS stimulation. Our functional study of transfection of let-7g mimics suppressed IL-6 expression post LPS stimulation in PMN was consistent with the result done in human umbilical vein endothelial cells . Intriguingly, the miR-142-3p and let-7g mimics repressed IL-6 mRNA and protein more significantly in cord than in adult PMN. This might be that endogenous miRNAs were lower in cord than adult PMN post LPS stimulation, and the gain-of function of transfection of miRNA mimics might noticeably increase the level of miRNAs that were lower in CB, which in turn repressed more IL-6 in cord than adult PMN. miR-142-3p and let-7g precursors supressed IL-6 mRNA and protein expression in cord blood (CB) and adult blood (AB) PMN. Indicated concentrations of (A) miR-142-3p mimics or (B) let-7g mimics or negative control (neg. ctrl) mimics were transfected into two CB and two AB PMN to study the effectiveness of the transfection. 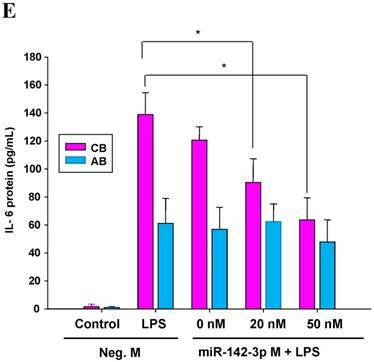 After CB and AB PMN were transfected with miR-142-3p mimics for 24 h, then they were stimulated with LPS for 24 h. (C) Their viability in culture media (mock), transfection media (FECT), miR-142-3p mimics (142-3p M) and negative control mimics (neg. M) were analysed by CCK-8. Indicated concentrations of miR-142-3-p mimics (M), let-7g mimics (M), or negative control mimics (neg. ctrl M; 20 nM) were transfected into CB and AB PMN for 24 h, then stimulated with 100 ng/mL of LPS for another 24 h. Cell pellets were collected from miR-142-3p M (D) or let-7g M (E) transfection and then indicated for IL-6 mRNA detection with qRT-PCR and the supernatant of miR-142-3p M (F) or let-7g M (G) were analyzed by ELISA for IL-6 protein concentration. The data shown are from 4-5 independent experiments. * denotes p < 0.05, ** denotes p < 0.01. Study had shown controversial on over or under expression of IL-6 by neutrophils . 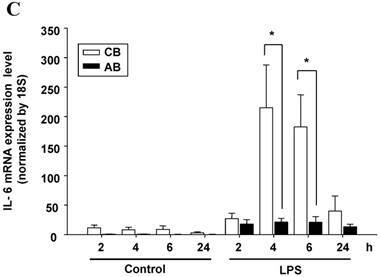 In our results, IL-6 protein expression after LPS stimulation in AB was relatively low and appeared at 24 h, whereas its mRNA was not detectable before LPS stimulation and expressed only after stimulation, which was in accordance with other studies [15, 16]. Interestingly, CB expressed high IL-6 mRNA and protein post LPS stimulation, which might demonstrates that neonatal PMN preserving endotoxin-induced IL-6, a cytokine with pro and anti-inflammation and Th2-polarizing activities. High IL-6 in cord blood predicted sepsis and cerebral white matter damage in neonates [4, 17, 18], higher IL-6 in neonatal monocytes after ex vivo LPS stimulation had been demonstrated as compared to adult [19-21]. Neonates are susceptible to infections; it has traditionally been attributed to the immaturity of their immune system. The functions of their PMNs are quantitatively and qualitatively impaired . Our research on cellular level adds new insight into that aside neonatal monocytes, and their PMN also expressed higher IL-6 mRNA and protein than adult ones after LPS stimulation. From the observations described above, it can be concluded that neonatal leukocytes exhibit altered inflammatory reaction which produced high IL-6 that might cause severe disease morbidity. miR-142-3p involved in cancer [23-26], infection , heart disease  and obesity [29, 30], whereas let-7g involved heavily in cancer [31, 32], vascular disease [13, 33] and obesity . To date, the role of these 2 miRNAs in PMN are still underexplored. Our results unravel the involvement of miR-142-3p and let-7g in the post-transcriptional regulation of LPS-induced augmented IL-6 production in neonatal PMNs. And role of miR-142-3p was more effective than let-7 on IL-6 suppression in neonatal PMN. The modulation of miRNA expression may be used to regulate abnormal proinflammatory reaction in newborns. Human umbilical cord blood was collected into heparinized tubes (10 U/mL) by cordocentesis at the time of normal spontaneous delivery or elective Caesarean section of term newborns to healthy mothers, after informed consents were obtained. The peripheral blood samples were collected from healthy adult volunteers aged 25 to 40 years. Peripheral blood and umbilical cord blood were subjected to dextran (4.5%) sedimentation at a ratio of 1:5 to separate leukocytes from red blood cells. Leukocytes were further separated into PMN and mononuclear cells by density gradient centrifugation in Ficoll-PaqueTM PLUS (GE, Health care Bio-science AB) at a ratio of 2:1, as previously described . All blood samples obtained were processed within 2 h. The Institutional Review Board of the study hospital approved the study protocol. Cord blood PMN (CB PMN) or adult peripheral blood PMN (AB PMN) were suspended at 1 x l06 cells/mL in RPMI-1640 medium (Gibco Laboratories, Grand Island, NY) containing 10% heat-inactivated fetal bovine serum. 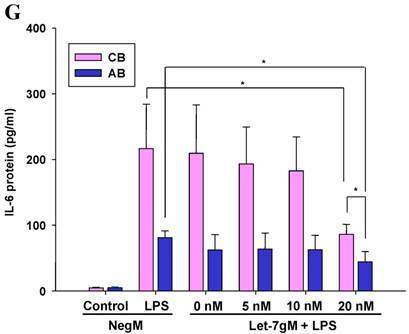 CB PMN and AB PMN were stimulated with/without 100 ng/mL of LPS in 24-well culture plates with a total solution of 0.5 mL in a humidified atmosphere of 5% CO2 at 37°C. The cell pellets and culture supernatants were collected at indicated time and analyzed IL-6 mRNA expression with qRT-PCR or IL-6 protein production with ELISA (eBioscience, San Diego, CA), respectively. The LPS used was from purified Escherichia coli 055:B5 (Sigma-Aldrich, Inc., St. Louis, USA). The immunohistochemistry of freshly purified PMN prepared in 1.5 x 104 cells/slide was performed using the stain kit Dako REAL™ EnVision™ Detection System-DAB (#K5007) following the manufacturer's protocol. The primary antibodies were rabbit polyclonal antibodies against human IL-6 purchased from Abcam (Cambridge, UK). In brief, the samples were incubated at 4°C overnight with the primary antibodies diluted 250 fold in Dako REAL™ antibody diluent, and then incubated with labeled polymer-HRP for 30 min, and substrate-chromogen solution for 5-10 min. For the negative controls, the samples were treated using the same method with the exception that they were incubated with the antibody diluents instead of the primary antibodies. The nuclei were counterstained with Mayer's hematoxylin and mounted with xylene based mounting medium. The images of the PMN were captured by using Zeiss Axiovert 200 microscope (Germany). Aperture of the objective lenses was 10×/0.35, WD 70 mm, temperature was 25oC, original magnification was 400 fold, with AxioCam ICC3 camera (Carl Zeiss), and the acquisition software was AxioVision Rel.4.8. (ii) 18S: forward primer 5'-GTA ACC CGT TGA ACC CCA TT-3'and reverse primer 5'-CCA TCC AAT CGG TAG TAG CG-3'. The PCR steps were activated by heating for 10 min at 95°C for 1 cycle, then for 15 s at 95°C, and finally for 60 s at 60°C for 40 cycles in a PCR mix containing 2 µL of the cDNA template, 0.5 µL of 10 µM primer, and 5 µL of SYBR GREEN master mix in a total volume of 20 µL. The system generated a kinetic amplification plot based on the normalized fluorescence. These PCR experiments included a negative control without a template to ensure absence of contamination. All reactions were performed in triplicate in an ABI 7500 sequence detection system (Applied Biosystems, Perkin-Elmer, Foster City, CA) . PMN in 1 × 106/mL were treated with 100 ng/mL of LPS for 4 h, then treated or not with 1 µg/mL of Act D or 5 µg/mL of CHX for the indicated time. PMN from the reactions with and without Act D or CHX were subjected to total RNA extraction by the TRIzol reagent. The degrading time of IL-6 mRNA expression after Act D treatment is inferred to de novo transcriptional level, whereas IL-6 mRNA expression after CHX treatment is inferred to post-transcriptional regulation . MicroRNAs from cord or adult PMN cells with or without LPS stimulation for 4 h were measured by BeadChip miRNA expression assay (PAS; Illumina) as previously described according to the manufacturer's protocol. The Illumina BeadArrayTM Reader detected 470 miRNAs as described in the miRBase database v9.1 and measured the signal intensity at each address location which corresponded to the quantity of the respective miRNA in the original sample. Results of the miRNA array were evaluated for their signal intensity and the 2-fold decrease or increase after LPS stimulation between neonatal and adult PMN cells were selected and integrated with miRNA prediction software program. The results were further validated by real-time quantitative RT-PCR. Various miRNAs expression were detected with the TaqMan® microRNA Reverse Transcription Kit, TaqMan® MicroRNA Primer Assays kit and TaqMan® 2X Universal PCR Master Mix (Applied Biosystem, Foster City, CA), in accordance with the manufacturer's instructions. Expression of snRNAU6 was used as an internal control. Reverse transcription was carried out on 20 ng of total RNA in 15 μL reactions using the TaqMan® MicroRNA Reverse Transcription Kit (Applied Biosystems, Foster City, CA), each RT-PCR reactions included 30 min at 16°C, 30 min at 42°C, and 5 min at 85ºC according to the manufacturer's instructions. Using an Applied Biosystems 7500 quantitative real-time PCR machine (Applied Biosystems, Perkin-Elmer, Foster City, CA), 20 μL real-time PCR reactions were carried out on 1 μL of cDNA using TaqMan® Universal PCR Master Mix (Applied Biosystems). Each real-time PCR reactions included 10 min at 95°C for one cycle, 15 s at 95°C, and 1 min at 60ºC for 40 cycles, in accordance with the manufacturer's instructions. The comparative threshold of PCR cycles (cycle threshold, Ct) value was used to calculate the relative miRNA expression. The amount of each miRNA (from cord or adult PMN with or without LPS stimulation) relative to snRNAU6 was calculated using the equation, 2-Δ(Ct), where Δ(Ct) = (CtmiRNA-CtsnRNAU6), method was used to determine relative-quantitative levels of individual miRNAs, and these were expressed as the fold-difference to the study/control condition, as previously described . Specific let-7g, miR-142-3p, or miR-26b miR-precursor molecules (Thermo scientific Dharmacon, miRDIA, mimic) and negative control precursor miRNAs were transfected into PMN at different final concentrations of 5 to 50 nM using FECT transfection reagent (Thermo scientific Dharmacon) as indicated. PMN in 5 × 105 cells/mL were cultured in RPMI-1640 medium supplemented with 10% fetal bovine serum and the transfection medium was added for transfection of miRNA mimic for 24 h. The transfection medium was prepared from the mixture of miRNA mimic medium and DharmaFECT medium with serum-free RPMI 1640 medium to a final volume of 500 μL, according to the manufacturer's instructions. 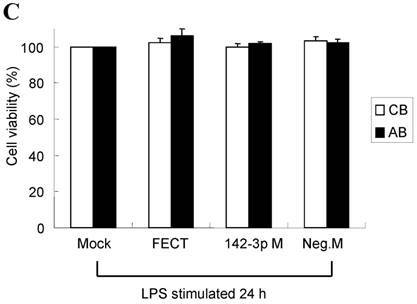 The transfected PMN were then stimulated with LPS (100 ng/mL) for 24 h in replaced RPMI-1640 medium and were supplemented with 10% fetal bovine serum. The let-7g, miR-142-3p, miR-26b or IL-6/18S mRNA expression from harvested PMN were measured by qRT-PCR. Culture supernatants were collected and then indicated for IL-6 protein detection with ELISA. To optimize an efficient transfection, cell proliferation and cytotoxicity assay were performed by cell counting kit-8 (CCK-8), (Dojindo technical). In brief, 5 × 104 cells per 100 μL medium were cultured in a 96 well-plate supplemented with 10 μL of CCK-8 solution. After incubation for 2 h, we measured the absorbance at 450 nm by a microplate reader. Data were expressed as mean ± SEM. The statistical calculation was performed with Mann-Whitney U-test. Results with a p-value of less than 0.05 were considered statistically significant. All statistical tests were performed using SPSS software. This study was supported in part by grant CMRPG 8C1361 (H-Chun Huang), CLRPG8B0053, CZRPG880253 from Chang Gung Memorial Hospital-Kaohsiung Medical Center, Kaohsiung; grants 102-2314-B-182A-045 (H-Chun Huang) and 099-2811-B-182-018 (KD Yang) from the Ministry of Science and Technology, Taiwan. We thank our colleagues from stem cell research core laboratory who provided insight and expertise that greatly assisted the research.